This cosy Provençal villa was recently restored and now sleeps 7. The house sits in 2.5 ha of land surrounded by Olives, vines and Cork Oak trees. The house faces south and has stunning views over farmland to the soft wooded hills beyond. You can sit on the terrace and watch the birds of prey circle overhead, listen to the crickets and watch the sun go down with a cool glass of Rose, and feel as if you are in the middle of nowhere. Yet you are only 12 km from the beaches of St Tropez. The house is small and cosy, and sleeps 7 in two double rooms, one twin bedded room with balcony, and a single room. There is a bathroom with a roll top bath en-suite with the master bedroom, and the second double bedroom has its own ensuite with stone surrounded bath tub. There is also a separate WC inside the house. The third bathroom with tiled shower and WC is accessible from the outside. The kitchen and sitting room have open fireplaces, and there is also a fireplace on the terrace for evening BBQ. (except in the summer when BBQ's are not permitted by the local authority) There is a large pool with 2 pool alarms, and a large Mediterranean style garden. Like most pools in this area, our pool is unheated, but in summer is warm enough for swimming in. The 2.5 hectare garden is enclosed by electric fence (to keep out the wild boar) and is very tranquil and private. It has a rustic feel, and you will see many types of birds and insects - especially butterflies, and at night, beautiful moths. If you are lucky, you will see a wild tortoise, and you will definitely see the geckos which scamper up and down the house walls at night catching insects. The last 500 meters of the road leading to the house is very rustic; it is not scary, but quite bumpy and rutted in places. It is not suitable for a low slung sports car, but otherwise is fine as long as you take it slowly. With a 4x4 it is no problem. Beaches: The nearest beach is Port Grimaud about 10km away. From here you can also take a ferry to St Tropez which is not only a great way to beat the traffic, but also to see the many huge and sometimes beautiful yachts in the bay. The beaches of St Tropez like Pamplonne are busy and glamorous with great beach side restaurants such as the famous Club 55 where the stars like to be seen having lunch. You might prefer the quieter coves like Canadel and le Lavandou, or you can take a short ferry ride to the beautiful island of Porqueroles where you can rent bikes, pack a picnic and visit the botanical garden. go-kart track near the Geant Casino supermarket is very popular. For younger children there is Aqualand. There are also numerous local caves and châteaux where you can sample the excellent local wines. The local town of Cogolin, whilst less idyllic than Grimaud and La Garde Freinet has many useful shops, banks, supermarkets and also a weekly market. The Grarde Canyon de Verdon is about an hour's drive to the North. In this amazing nature reserve you can do canoeing, rock climbing, white river rafting or just take in the incredible geological features, and breathtaking scenery. About 35 min drive North is the perfectly preserved Cistercian monastery of Le Thoronet which was founded in 1120.
toilet, tub, This bathroom is ensuite to the second double bedroom. outdoor shower, There is an outside shower next to the laundry room. There are two ensuite bathroom inside the house both with large cast iron baths. Accessible from the outside is the laundry/shower room, and a further shower is located on the outside of the house. All bedding is pure cotton/linen. All towels, facecloths, pool towels and dishcloths etc are provided. There are two fireplaces inside the house and one outside fireplace on the kitchen terrace for winter/early spring and autumn use. By law, none of these may be used during the summer. Yes. All the towels you will need for pool/beach and bathing etc. 2 big sofas, 2 armchairs, desk, and open fireplace for winter evenings. All the dishes and utensils you might need are supplied. The cosy kitchen has an electric oven, an induction hob, a dishwasher, stone butlers sink. Stone surfaces and all the cooking equipment you would expect in a well stocked kitchen. 2.5 hectares with mature Cork oak trees,olives trees, orchard trees, figs, vines and Mediterranean garden plants. There is a small balcony attached to the twin bedded room with lovely views over the garden and vineyards. Stone terrace outside the second double bedroom which has french doors to it. Lovely stone terrace with vine covered pergola and stunning views. Large extendable wooden table and wooden chairs. The house is built on several levels, and the grounds although lovely and spacious (2.5 hectares) are also sloping in parts. Very large deep outdoor pool (alarmed) surrounded by large stone terrace. 6 wooden sun beds with towelling covered cushions. As both the house and garden are on many levels with numerous ruins, wells and a steep escapement to the south, the property is not suitable for small unsupervised children. It is perfect for elderly people as it is so peaceful, but not if they are infirm, due to the many levels. We enjoyed the charm of the house, the silence and the beautiful surroundings. The house is comfortable and nicely decorated, it is clean and well-maintained. Wonderful and very charming property ! This is the second time now we spend a week in this very charming property between La Garde Freinet and Grimaud. The house is very spacious, tastefully furnished and contains all amenities you would expect. The large pool in the lower part of the garden is just wonderful. You enter the property, close the gate and after seconds you relax and feel like you have been there already for a long time ... it feels like being at home. This is the best place to enjoy/explore the wonderful area with the beaches or wine yards, La Garde Freinet or Grimaud ..... or just stay where you are, breathe, swim and enjoy a cool Rosé on the verandah. Thanks again for this great experience ! We truly enjoyed our stay in this absolutely lovely and very comfortable Provencale farm house, full of charm and in a most beautiful and completely private setting. We had wonderful meals on the stone terrace, with delicious local produce from the charming villages nearby, as well as wonderfully relaxing times at the beautiful pool. The house and pool is very well maintained, with a great and very friendly service from the owners manager. We are coming back!! (German) Ein sehr schönes Haus in toller Lage. Wir haben die Ruhe sehr genossen! Das Haus ist liebevoll eingerichtet und die Ausstattung ist sehr gut. Der Bäcker und die Croissants im nächsten Ort sind der Hammer. Der Außengrill konnte leider aufgrund der Brandgefahr nicht benutzt werden. Es war sehr trocken und die Brandgefahr somit sehr hoch. Ein toller Pool mit herlicher Ausicht ins Tal lassen einen den stressigen Altag schnell wergessen. Ein optimales Haus für eine Familie mit Kinder. Das Klima ist optimal, es weht immer ein leichter Wind von den Bergen. Wir würden auf alle Fälle noch einmal wiederkommen. "A beautiful house in a great location - we very much enjoyed the peace and quiet. The house is lovingly decorated and the furnishing is excellent. The bakery and croissants in the nearest village are amazing. We enjoyed our stay in this house, the pool area is wonderful, and with the very hot weather it was where we spent our time, plus the outside shower is fantastic, and was used all the time. The views in the evening are really special, and made time sitting on the patio what holidays are made of. 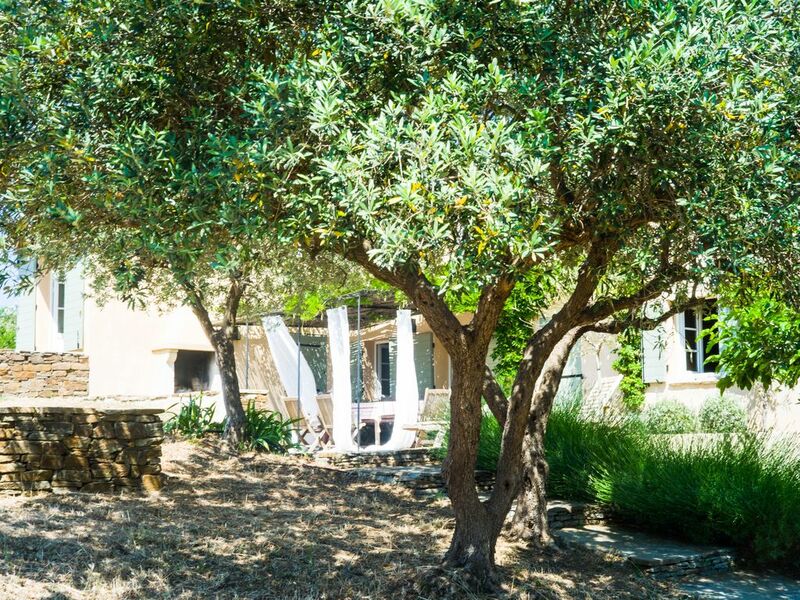 Had the most wonderfull holiday in this beautifull , secluded farm house set amongst the vineyards , it was in such a peaceful spot , yet so close to other busy villages such a Grimaud, and vibrant St Tropez, it was the perfect antidote . The house itself is really well decorated in a simple Provençal style in muted colours , the kitchen is really well appointed , so cooking is a treat , and the outdoor eating area is just off it . It is all very cosy , practical and in extremely good taste . The swimming pool is also a real drawing point as it is large enough to really swim in , unlike many homes with tiny plunge pools . This part of France is perfect for holidays, situated between the dramatic Massif des Maures mountains to the North, and the beautiful beaches of the Cote d'Azur to the South. You can choose the glitzy beaches and restaurants of St Tropez, or the quieter coves like Canadel or Le Lavandou. The beautiful Iles d'Or with their crystal clear water and unspoilt beaches are a short ferry ride away. Here you can rent bikes, pack a picnic and visit the stunning botanical gardens. St Tropez is where to go for designer shops,big yachts and people watching. Closer to home, you can visit the hilltop villages of Grimaud and La Garde Freinet with their tiny winding streets, excellent family run shops and restaurants, and their busy weekly markets. Local Caves where you can sample the delicious local wines are always worth a visit. For the more active there are many local Golf courses, a thrilling go-kart track for older children, as well as windsurfers and boats to rent at the local beaches. Other Activities: Shopping, wine tasting, markets, water skiing, boat rentals, quad biking, theme park, water park, tennis. Golf: There are numerous golf courses in the region. The nearest are Beauvalon with 18 holes, 5800 m, par 72, Valcros with 18 holes, 5274 m, par 70, and Sainte Maxime Golf - Course with18 holes, 6155 m, par 72. Ski: There are some small local ski resorts in the Southern Alps within an hour and a half's drive. Of the bigger resorts, Isola is 190 km away. Following email confirmation, your booking will be held following receipt of 50% of the rental amount has been received. The balance is required 6 weeks before your arrival. If your booking is within 6 weeks the full amount will be required to confirm your booking. A refundable security deposit of Euro 750 is also required in the event of any damage or breakages. Cancellation charges; Up to 12 weeks before arrival; Full refund. Up to 8 weeks, 50% of rate refunded. Minumum 4 weeks; 25% of rate refunded. Less than 4 weeks, no refund. The water at the property comes from our own source and is suitable for washing and cooking in, but not for drinking. Please make sure that you buy sufficient bottled water for your own consumption. Please note that the last part of the road is rustic and uneven and may not be suitable for low slung sports cars or similar. Please also note that the pool is unfenced, and whilst there are 2 pool alarms,you are responsible for supervising your children or non swimmers. Clean linen and towels are included in the rental as is a reasonable clean of the property after your departure. Please leave the property clean and tidy and with all your rubbish removed at the end of your stay. If the property has been left in an unusually dirty and or untidy state then the Property Manager will charge for the extra cost of any cleaning required, and this will be taken out of your deposit.